Three Whites. Contribution to the sound art exhibtion "Rock's Role (After Ryoanji) at Art in General, NYC, April-June 2004. Three Whites is an electro-acoustic composition based on a sound recording of myself playing a game of French or Carambolage Billiard. This version of Billiard is played with three balls (and without pockets), hence the title three whites. The piece mostly consists of the clicking and bouncing of balls, billiard stick noises, and general environmental sounds. Recently, I used this sound recording for the eight-channel sound installation Dreiband. The visual part of the installation consisted of three white billiard balls hanging suspended from the ceiling, in relation to a white frame that had the proportions of a billiard table. The visual imagery of Carambolage Billiard always reminded me of the tradition of Japanese stone gardens, so when I heard about the Rocks Role project, this connection immediately sprang to mind. I think that there is a strong aesthetic connection between the game of Carambole Billiard and a stone garden, in both cases a spatial (and emotional) setting is defined by very few elements, creating a notion of emptiness and offering a very particular experience of time. Musically speaking, the sounds of clicking billiard balls form a repetitive structure, but each single sound events always sounds different. There is an entire micro-universe to be discovered in each game of billiard. An audio CD of the group exhibition 'Rock's Role (After Ryoanjy)' has been published by Art in General in May 2004. Sound happens. In art as in life, in movies as in bars, it is increasingly diverse, unavoidable and at times severe. One of the notable benefits of this expansion is "New Sound, New York," a sound-art festival overseen by the Kitchen and Cooper Union and presented by Time Out New York. It has recently reached critical mass in terms of what might be called listening-looking opportunities: two engagingly dovetailed exhibitions, complemented by two outdoor installations in Lower Manhattan. The shows approach their subject from opposite directions, exposing many of sound art's amorphous possibilities and some of its history. At Art in General in TriBeCa, the artist-composer Ron Kuivila has organized "Rock's Role (After Ryoanji)," which pushes music out of the recital hall toward spatial and sculptural installation; its all-in-one presentation questions the autonomy of the individual ego. The show is also part of the Buddhism Project Consortium and is intended to examine the influence of John Cage's interest in Buddhism on subsequent artists. (...) "Rock's Role (After Ryoanji)" is one of the most beautiful shows ever mounted at Art in General. It seems tailor made for the gallery's clean, well-lighted loft space because it is, as Mr. Kuivila writes in the introduction to the show's CD, "an exhibition of sound works that embrace overlap." Selected mostly from an open call for submissions, the show melds 17 sound works and musical compositions into a remarkably effective installation piece without destroying their individual characters. Guided by the intricate, seemingly random capabilities of the SuperCollider computer program, and grouped according to playing time, these pieces emanate at irregular intervals from 15 speakers arranged on an expanse of white cellulose packing peanuts. The visual effect is of a Japanese rock garden, like the famous one at the Ryoanji temple in Kyoto that Cage visited on his first trip to Japan in 1962. Cage had already established that any sound, and even silence, could be considered music. The Japanese gardens clarified his concept of indeterminacy by suggesting that the sounds of a musical composition could function as either sand or rocks; they could be either continuous or isolated episodes, a concept that could greatly increase the play of chance in a work. Bernhard Gal's "Three Whites" is the primary sand in "Rock's Role." Whenever the show is switched on, "Three Whites" punctuates whatever else is happening with the sharp snap of colliding billiard balls at irregular, maddeningly nonrhythmic intervals (also evoking Cage's use of the I Ching). Much finer sand is provided by John Hudak's "Breathe," whose gentle whispering sounds, close to breathing or the lightest of winds, sometimes emerge during moments of extreme quiet. The various rocks, which can last anywhere from 27 seconds to 30 minutes, offer a short history of avant-garde music. There are pre-electronic pieces, most prominently Rilo Chmielorz's work, which aggressively uses and misuses an electric guitar, and there is also a range of found-sound works. You will hear sounds both local and synthesized that may remind you of thunderstorms, people talking, an off-key flute (actually being played by the wind), or a bloodhound on speed madly sniffing for clues. 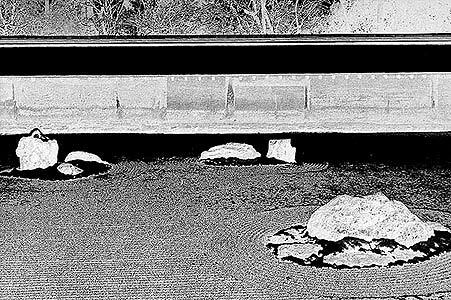 John Cage's transliterations of the Zen rock garden at Ryoanji involve musical equivalents for the empty space of sand and the rock structures. For curator Ron Kuivila's Rock's Role (After Ryoanji) at Art in General, sound artists respond to Cage's work with sand pieces, another two with rock pieces, with Kuivila's tweaked SuperCollider opensource audio synthesis program blending and meshing them in space. "The sand works are discrete sounds with irregular pulses," said Art in General's Jennifer Gootman, "while the rocks are glissandi, or events that happen," including the billiard-ball knocks of Bernhard Gal. "The nature of the exhibit is constantly changing; when in the space, you hear sounds from the various pieces but you can't necessarily tell whose they are. Kuivila's programming embraces them in a way that realizes Buddhist concepts of multi-centeredness and multi-connection." On the whole, museums and galleries haven't found any durable solutions to the vexing sound-bleed problems that can plague an exhibition attempting to include multiple sound-based works inside close quarters, but curator Ron Kuivila came up with breezy solution that became the entire conceptual impetus behind the sonic construction and visual presentation of Rock's Role (After Ryoanji)-it's simple really: embrace the overlap. Informed by one of Japan's most famous Zen gardens as well as John Cage's flexible arrangement of pieces titled Ryoanji, from its inception Rock's Role has been an elaborate Cage-modeled change operation thoroughly and thoughtfully manifested. Beginning with an open call to composers and sound artists encouraging submissions specifically tailored to be combined with the creations of their (unknown to them) colleagues, the work of seventeen artists was selected. Using an array of 15 speakers arranged on a plane of Styrofoam packing peanuts on the floor of Art in General's main gallery (attempting to emulate the constellation of rocks and sand that comprise Kyoto's treasured Zen garden), the banks of sound pieces, ranging from just seconds in length to over thirty minutes, are disbursed via a randomly plotted, multilayered time structure driven by Max to create a generative meta-mix of the all artists' work in real time. Despite the several layers of simultaneous sound, the overall effect is more meditative and blissfully detailed than one would expect from a Zen garden carpeted with Styrofoam. Dominating both the gallery installation and this CD document is Viennese sound artist Bernhard Gál's Three Whites, a recording of the artist playing French billiards, which is played with three balls on a table without pockets. Gál notes that the vast surface of the pool table checkered with a few balls alludes to the physical similarities and spare aesthetic of the Ryoanji garden. More striking is that his piece seems to function very much like the percussion part in Cage's Ryoanji, vertical temporal divisions gluing together a constantly evolving expanse of time. While clarification isn't provided in regards to whose work is played on which of the 28 tracks, Brenda Hutchinson's Ambient Poems performed with her signature long pipe, and Michael Schumacher's acoustic-based work distinguish themselves separately from the well-crafted lowercase styled electronic works and field recordings. Work by Americans Gabriel Burian-Mohr, Damian Catera, David Galbraith, Mike Hallenbeck, John Hudak, David Matorin, Andrew Neumann, Maggi Payne, Masahiko Sunami, Ed Tomney, and Stephen Vitiello, as well as other artists from across the pond like Rilo Chmielorz, Barbara Held, and Future Remix pepper the disc's distinctively alluring soundscape. As if this overlapping survey of current sound art and electronic music weren't attractive enough, the CD is only $5. A ridiculous bargain, especially if you can't make a sojourn to Art in General to see Rock's Role in person before it closes on June 26. Last year, composer Ronald J. Kuivila sent out an open call for submissions to an exhibition he was organizing for the alternative space Art in General. The idea was to create a tribute to John Cage's series of musical compositions called "Ryoanji," which Cage had undertaken in 1983, basing his work on the famous 16th-century karesansui garden of that name in Kyoto. There, 15 stones in constantly raked white sand are meant to evoke the natural landscape, sparking different associations in the minds of those who contemplate the arrangement. In keeping with the Zen principles underlying the garden, Cage conceived his compositions as an interplay of elements he called discrete (perversely, the sand) and continuous (the rocks). Musicians are given the liberty to perform within certain parameters having to do with time and silence. Wishing to maintain these ideas while giving them a completely fresh spin, in keeping with Cage's famous antipathy to retrospection, Kuivila and several associates selected from the submissions and also invited a few other composers to create a soundscape of 17 works. Two of them, one by the Viennese composer Bernhard Gal and the other by the American John Hudak, formed the "discrete" elements: the sound of billiard balls in play and a barely perceptible breathing. The "continuous" elements were 15 pieces ranging from 27 seconds to 30 minutes in length, by an international roster of composers. Using the SuperCollider computer program, Kuivila arranged the works according to average duration and other factors, and they played from 15 speakers of different shapes and sizes arranged in the gallery over a bed of white packing peanuts, which both improved the acoustics and evoked the garden's white sand. It was a striking installation, in which abstract principles, challenging even to those most patiently attending the written explanations, disappeared into the work's fascinating aural effects and its witty and oddly meditative visual ambience. Benches deposited around the periphery of the "garden" allowed the visitor to sit for long periods listening to a soundscape of constant variation, anchored to the randomly ordered crack of the billiard balls and the respiration that seemed, as time passed, to become one with the visitor's own breath. Tracks of all sorts registered sometimes as purely electronic, sometimes as resemblances to familiar noises--squeaking mice, buzzing insects. Found sounds--children playing, a man speaking, etc.--combined with ingeniously provoked instrumentals, such as a flute played by the wind blowing over its mouthpiece, to complete the texture. In a small adjacent room, one could watch a monitor with the composers' names plotted in changing groups depending on where their pieces turned up, at one speaker or another. It was fun to see this, but it would have been distracting in the larger room, where one more intuitively followed the sounds alone. In time, these seemed to grow more concrete, vectors made manifest, crisscrossing the room, appearing, disappearing and resurfacing first here, then there. Luckily, a CD was made to preserve 28 tracks of the shifting sounds. Kuivila recommends that, in the spirit of the exhibition and of Cage himself, the tracks always be listened to in--guess what--shuffle mode. Sound, something that takes place in many forms, is being utilized in new and creative ways, outside the realm of the everyday experience. Sound art is infiltrating downtown with an auditory exhibition curated by Ron Kuilvila entitled Rock's Role (After Ryoanji). The show, taking place at Art In General is part of "New Sound, New York," a citywide festival of performances, installations and public dialogues featuring works by a variety of sound artists. Based on the original Ryoanji, one of the most famous Zen gardens in Japan and the title of a series of pieces composed by sound artist John Cage (1983-1985), this exhibition was created by gathering 17 works from an open call for submissions. Composers and sound artists were requested to create short works that responded to a piece by John Cage, who was also inspired by the famed rock garden and his interest in Buddhism. The visual and auditory affect of the exhibit is meant to mimic the effect of a Japanese rock garden like the famous one at the Ryoanji temple in Koyoto visited by Cage on his first trip to Japan. With this project, curator Ron Kuivila wanted to evoke two types of sound. "The Rocks," the continuous elements of the overall work are the up-front sounds, never reaching an ultimate pitch or moment. "The Sand," or the irregular pulse, are the discrete sounds, underlying the entire soundscape which are meant to notate the passage of time with no beginning, middle, or end. "What makes it really original and what Ron talks about is the idea of embracing overlap in sound, that each sound is not isolated," said Jennifer Gootman Communications director for Art In General. "This kind of, in a way, embraces that intrinsic property of sound, that it will escape." The ultimate idea was to explore how space and music interact with each other and the idea that any sound including natural, electronic or even silence, is significant and should be considered a musical form. The Japanese Rock garden represents the idea that music functions as either sand or rocks, continuous or isolated occurrences of chance, and therefore no single sound interval is repeated at any time during this exhibit. Every sound experience showcased here is literally a singular event, only to take place at one point in time, and never to be repeated in the same sequence. "Rock's Role explores the possibilities open to sound works to embrace, rather than eschew, the leakage and overlap that is an inescapable attribute of the physics of sound," writes Ron Kuivila in an essay about the project. "By refusing any stable distinction between signal and noise and by accepting that the soundscape of the semipublic space of the gallery is to be shared, this exhibition provides an experience of "multicenteredness and interpenetration" on a physical level. The final product is a composition of sounds that combines the individual pieces of each artist into one, without jeopardizing the uniqueness of each composition. By utilizing the SuperCollider computer program, each composition is selected automatically and plays in coordination with the others at purposefully organized irregular intervals. From 15 speakers, representing the rocklike boulders in the Japanese garden and placed throughout the large sixth floor loft space gallery, sounds are emulated. The speakers sit in a sea of Styrofoam peanuts, which cover the ground, representing the white pebble surface of the original garden. Wooden benches span one side of the room, so that listeners can sit adjacent to the exhibit while taking in both the obscurity and obviousness of this selection of sound clips. Next to the main gallery is a smaller space with Cage's compositional scores and notes regarding his ideas surrounding the original Ryoanji, a Nam June Paik video of a Cage Performance, and a map of the speakers in the main room, displaying the name of each artist in highlighted letters as their composition broadcasts over the speakers. The sounds force the listener to reinterpret their notion of the traditional synchronized sound of music. Whereas most ears automatically expect to find patterns in produced sounds, this exhibition challenges the notion of synchronized, and easy accessibility in sound. The "sand" is portrayed through pieces like Bernhard Gal's "Three Whites" which continually displays the loud clanking of billiard balls at non-rhythmic intervals, continuous beneath the "rock" representations in the rest of the piece. John Hudak, whose work focuses on the minimalism in sound below the usual threshold of hearing, contributes "Breathe" which softly blows whispering, breath-like sounds which are only audible in the more silent spans of sound in the piece. Representing the "Rocks" are artists like Mike Hallenbeck who works with the sounds of daily life. His piece "Bronze Concrete" was created from the sound of four bronze sculptures being scraped along a concrete floor and then interspersed with silence episodes. Masahiiko Sunami contributes the "Soundwave Garden" which is based on a principle of random sounds at different frequencies making the listener's experience completely based upon their position within the space itself. While some sounds, like the billiard balls or of those of voices or sirens, can be immediately recognized and associated with physical situations, others including the sound of electronically produced feedback remain abstract and mysterious. When juxtaposed these different sound experiences are accentuated by each other and represent the many possibilities of sound as well as the use of silence itself as an instrument.